In November, we not only focus on The Rotary Foundation as a theme, we focus on gratitude. We have so much for which to be thankful. I am thankful to have the opportunity to serve as your District Governor in this year in which we celebrate our Rotary Foundation's Centennial and its accomplishments all year long. I hope that your club is celebrating the Centennial and that you have had a special program on The Rotary Foundation in November. If your club hasn't decided on how best to celebrate the Centennial, here are some ideas. Many of you have heard me talk about this video, A Century of Doing Good. A brief summary of all our Rotary Foundation has done over the past 100 years, I think it's one of Rotary's best. If you haven't yet registered for the Rotary International Convention to be held 10-14 June 2017, please register today. If you register by 15 December, you'll still receive the special early registration discount of $340. There are many convention events that you will not want to miss. And we have the opportunity to show the world our southern hospitality as volunteers. In honor of The Rotary Foundation's Centennial, we are working toward raising $300 million this Rotary year. Many in Rotary District 6910 have made special gifts, in honor of and commemorating our Centennial. Not only did we recently receive our first Arch Klumph Society gift (story here), we have received a number of other special gifts and bequests to The Rotary Foundation. Please consider a special gift to The Rotary Foundation in your year-end planning. Your gift not only helps us achieve this goal, it helps to ensure another century of doing good in the world. If you'd like to be a part of our Million Dollar Dinner with President John Germ as the keynote speaker, an outright or bequest gift of at least $10,000 will secure you an invitation. I thank you for your ongoing support of our Rotary Foundation and for your consideration in future giving. For a look at one example of a project recently funded by our Rotary Foundation, take a look at this video. Second language education was the focus of a Rotary Vocational Training Team Exchange between our Rotary District 6910 and District 1820 in Germany. A visit to Rotary Showcase will let you see the good work Rotary clubs are doing locally and globally. Thank you to Rotary 6910 clubs who have taken the time to ensure their good work is featured here on Rotary Showcase for the world to see. You can search by 'District' to see the good work that clubs in our district are doing. Congratulations to the newest clubs who have achieved 100% Paul Harris Fellow Club. Here's the latest list of clubs who have achieved this outstanding recognition. If your club would like help as to how to achieve this level of recognition, please contact me or Bill St. Clair, our District Foundation Chair. 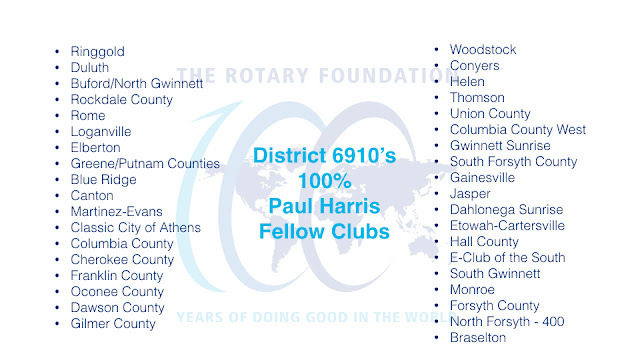 The three districts in Georgia are all working to achieve 100% Paul Harris Fellow clubs in Georgia prior to the world coming to Atlanta in celebration of The Foundation's Centennial. At the bottom of this message, you'll find the approved verbiage for updates in our District 6910 Policy Manual that received recent preliminary approval by our District 6910 board. If no objections are filed by December 23, 2016, these changes will be brought again before the board for board enactment and approval at next board meeting. I wish for you and your family a Happy and safe Thanksgiving. Thank you for all you do. this Policy Manual shall be deemed to be amended accordingly. 5. References and paragraph related to District 6910 PETS are removed from Policy Manual. 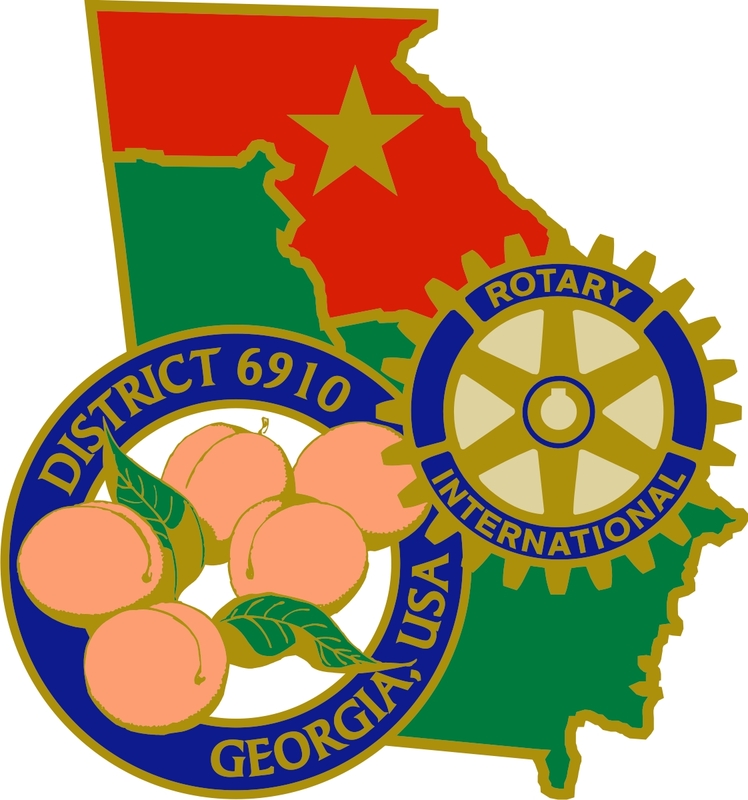 District 6910 Presidents-Elect to attend Georgia PETS. choosing the COL Representative from those qualified candidates proposed by the clubs. 7. Family of Rotary Committee responsibilities are removed from that of District Chaplain. 8. District Conference should be held at any time during the Rotary year. after serving an initial term. allocation to be District Governor’s. being that of District Governor. no longer Rotary Foundation supported programs. Conference Budget to District Governor at least ninety (90) days preceding conference.